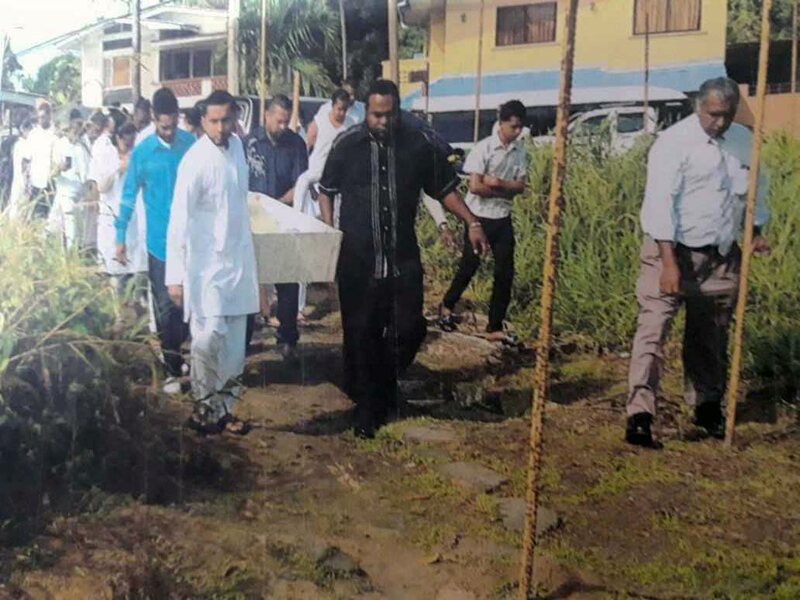 BLOCKED:This photo shows mourners carrying the coffin of the wife of Surujdeen Dookran, 81, as they met steel bars placed along a pathway leading to Dookran⁳ Couva home, which is the subject of a land dispute involving his neighbour which has now reached the courts. IT IS a case of the dead being unable to pass freely. A land dispute between two neigbours which has now reached the High Courts, saw steel bars being placed by one neighbour along a trace meant to prevent the other neighbour and his relatives from accessing their respective houses. The land dispute case came up before Justice Ronnie Boodoosingh yesterday in the San Fernando High Court and the judge requested that both parties who are claiming right-of-way, appear before him next week Monday. The disputed piece of land is at Trace No 2, Carolina Village in Couva. Surujdeen Dookran, 71, filed an injunction on Wednesday against neighbour Poley Sooknanan, 81. Dookran is joined in the High Court injunction by nephews Krishna Lagan and Rajhindra Lagan who also live near the trace and are claiming they have been using it as a right-of-way, to get to and from their homes, for the past 33 years. A former Caroni (1975) Ltd employee, Dookran said in the lawsuit filed by his attorney Stephen Boodram that he and the Lagans usually drove along the trace to get to their respective homes. Trucks transported material and bicycles traversed the trace uninterrupted. In fact, they all parked their cars at their respective homes. The lawsuit stated that in October 2017, Sooknanan erected several steel poles, each eight feet in length across the track, effectively blocking vehicular access to several houses. Without any other alternative access to their homes, the claimants said they felt marooned. On Monday, a wire fence was erected across the pathway, preventing even human access to the claimants’ houses. Dookran, without stating the date in his lawsuit, claimed that when his wife fell ill recently, the family called for an ambulance. However, the vehicle could not enter the trace due to the steel bars. Relatives had to lift Mrs Dookran in a stretcher and walk along the pathway and then through the steel bars. Days later, his wife died. The family held a funeral service at their home but the hearse transporting the coffin could not access the trace because of the steel bars. Dookran said mourners took the coffin out of the hearse and walked along the pathway until they came upon the steel bars. Mourners had to lifted the coffin over the bars and worm their way around the bars. Dookran attached a photo of pallbearers carrying his wife’s coffin up to the point where the steel bars were erected, for the court’s consideration. Contending that Sooknanan is wrong about having exclusive right to the trace, Dookran said that following Monday’s erection of the fence, he caused it to be removed in order for the families who live on the other side to at least be able to walk to their houses. Yesterday, Boodram made legal submissions to Justice Boodoosingh seeking his permission to grant the injunction. However, the judge said he wants Sooknanan in court next Monday to hear his side of the story. Only then will Boodoosingh decide whether the injunction should be granted or not. Reply to "DEAD SHALL NOT PASS"